This beautiful church is a Grade II* listed local landmark is brimming with history and here for everyone. Come and explore, open daily 9.00-5.00. Kirkham (meaning 'Church Town') has had its church since at least 684AD, although 17th century gravestones are now the earliest surviving feature. The current building dates from 1822 and was designed by Preston architect, Robert Roper. 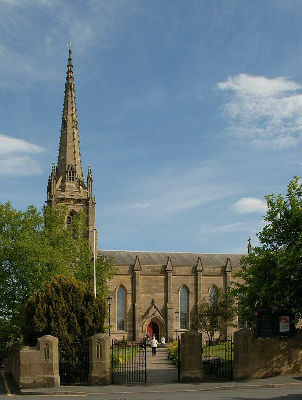 The 46m (150') high tower and spire were added in 1844 by Edmund Sharpe and finally the chancel, which houses the High Altar, choir stalls, vestry rooms and organ, was added in 1853. Find out about our Church Bells. The large open nave retains its traditional pews, including two 18th century Churchwardens' box pews salvaged from the previous building. The vibrant red ceiling is divided by painted ribs decorated with gilded bosses, each of a different design. 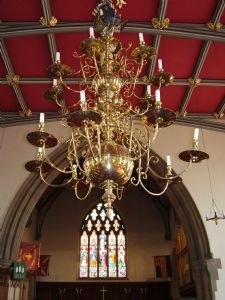 Above the centre aisle hangs a stunning brass candelabra dated 1725 made by Brown of Wigan. This looks particularly beautiful during special services such as Christingle when our electric lights are switched off. 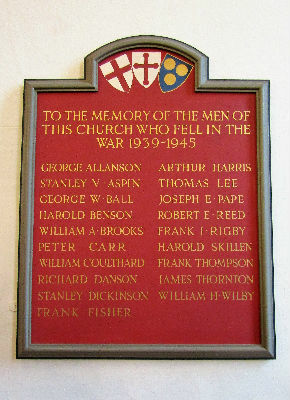 There are various memorials around the walls, including those to victims of the two World Wars, the Cliftons of Lytham Hall and Lieutenant Henry Rishton Buck who died at the Battle of Waterloo. 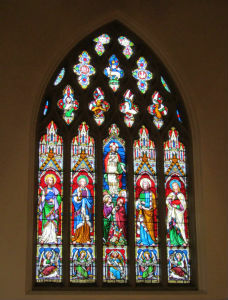 The large stained glass window above the High Altar depicts the risen Christ and the writers of the four Gosepls; Saints Matthew, Mark, Luke and John. The west end of the nave has now been redeveloped as the Spire Venue, providing community facilities available for hire. Originally, galleries ran down both sides too, but these were removed as unsafe in the 1960's. The Church has three altars; the High Altar used at our main Sunday service and for other large gatherings, and two side altars. 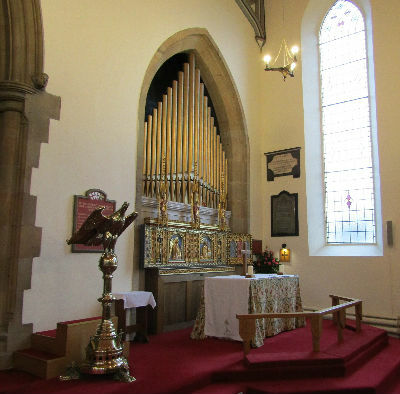 The area immediately around the high altar, known as the Sanctuary, is separated from the rest of the chancel by steps and a brass altar rail. People come to kneel or stand here when they receive Holy Communion or a blessing. 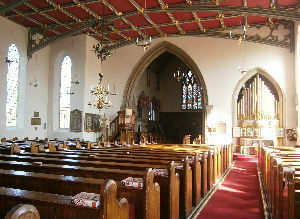 At the sides of the chancel are the Choir stalls and organ. 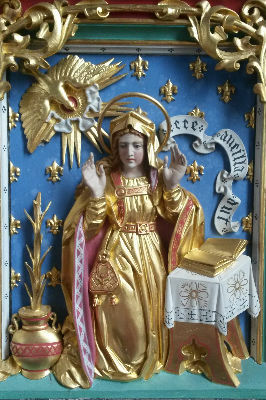 This altar is dedicated to the Blessed Virgin Mary, hence that area of the nave is known as the Lady Chapel. Its more intimate surroundings are where we celebrate Holy Communion mid-week and gather for Morning Prayer and Compline. 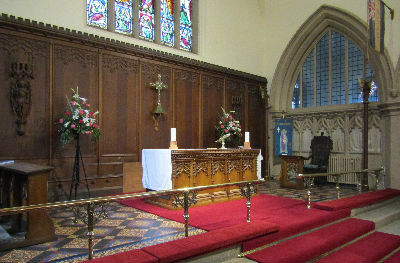 Behind the altar, below the organ pipes, is a painted and gilded wooden reredos (a decorated altar back) dated 1900. It depicts the Annunciation: the announcement by the Angel Gabriel to Mary, that she would give birth to Jesus. 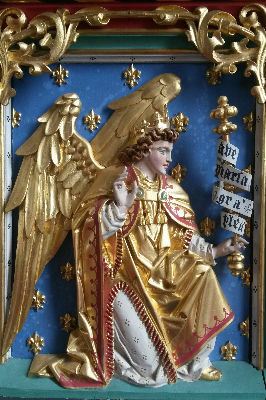 It was made in the workshops of Charles Eamer Kempe, who was famous for such church decoration, and came from the Latin Chapel of Christ Church Cathedral, Oxford. The College are our patrons who traditionally appointed the Vicar. Its folding case is closed during Advent and Lent to emphasise that these are times of intentional simplicity which help create space in busy lives for the renewal of a prayerful relationship with God. The Lady Chapel is where the Reserved Sacrament (bread which has been blessed during a service of Holy Communion) is kept. This is to ensure that it is available at very short notice to take to those who are seriously ill or housebound. Its presence is indicated by the sacrament lamp being kept alight as a constant reminder that Christ is with us. 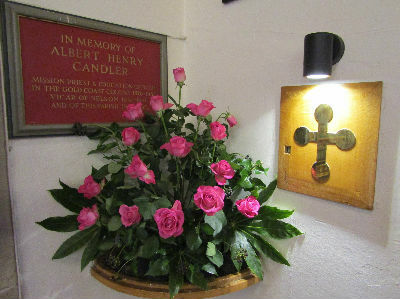 The second side altar is a military chapel which houses our two war memorials. The lectern cloth, known as a 'pulpit fall', indicates the Church season. Each part of the liturgical year and feast days are associated with particular colours; Advent and Lent purple, Holy Week and Pentecost red, Ordinary Time (the 'ordered' or counted time between other seasons) green, Christmas and Easter white or gold. Matching vestments are worn by the priest. The intention is help us focus on the nature of the season or service, whether that be celebratory or reflective. 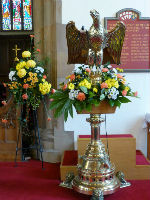 The brass lectern is in the traditional form of an eagle, associated with John the Apostle, and hence with St John the Evangelist, the author of the fourth gospel. 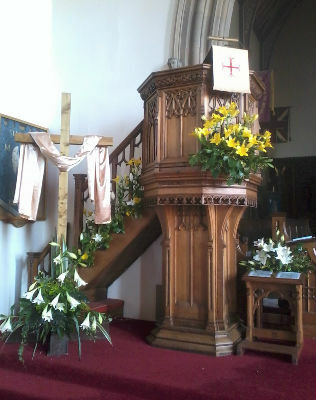 Today, the lectern is used not only for readings, but also sermons. 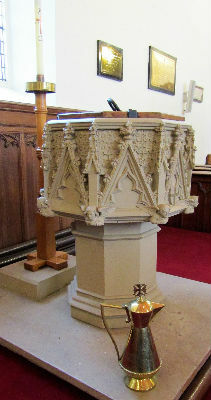 The Victorian octagonal stone font is located half way down the north side of the nave. It originally stood close to the main door, as is more usual, to symbolise entrance into the Christian community through Holy Baptism (Christening). The brass jug holds the blessed water which will be poured into the font. The water sprinkled onto the head of those being baptised symbolises renewal and new beginnings in God's love. Alongside the font stands the Paschal Candle. This is a symbol of the Risen Christ, Light of the World, and is blessed each year on Easter Day. It is then lit for each Baptism and used to light the Baptismal Candle given to each adult or child baptised. We have two burial grounds; the original graveyard which immediately surrounds the Church and the more modern one opposite. For information on the records for these, see here. Please do come inside to look around.